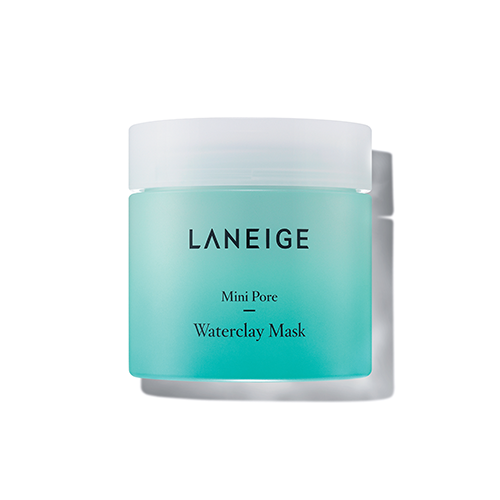 LANEIGE Mini Pore Waterclay Mask is an innovative clay mask that will not dry out your skin. This mask contains Mineral Mud from the Yellow Sea to minimise the appearance of pores, reduce excess sebum and improve your skin’s vitality. Suited for combination, oily and acne prone skin types. Recommended to use twice weekly for maximum results. This clay mask has a moisturising gel-base formula, allowing for a smooth application. The gel-base also prevents the clay from drying out your skin. Mineral-rich Mud from the Yellow Sea will remove dead skin cells and minimise the appearance of your pores with its powerful sebum-absorbing properties. Laneige Mini Pore Waterclay Mask dries in 10 minutes however is best washed off after 8 minutes. Yellow Sea Mineral Mud 1400mg – natural, purified, mineral rich mud from the Yellow Sea that effectively picks up sebum and delivers nutrients and minerals into your skin. After cleansing, apply a layer of the clay gel mask over your entire face. Allow the mask to dry for approx. 8-9 minutes. Wet the sea sponge provided in the packaging and use to remove the residue. LFI Tip: Even if there are still some small, slightly damp areas of the mask, as long as when you touch the mask no clay transfers to your fingertips, it can be removed. Recommended use is twice a week.